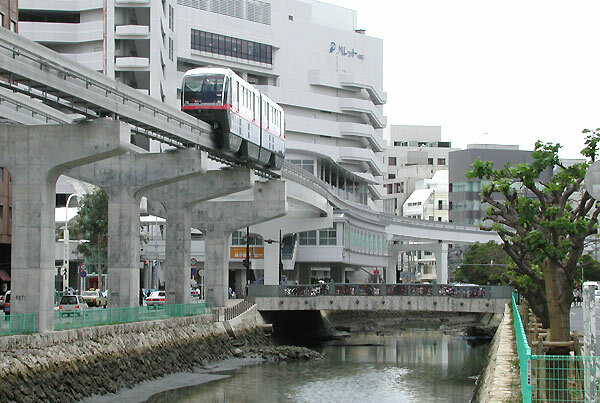 On April 17, 2003, videographer David M. Ice and I were treated to a sneak preview of the new Okinawa Monorail. Naha is the largest city on the island with a population of 300,000 in the city and surrounding area. 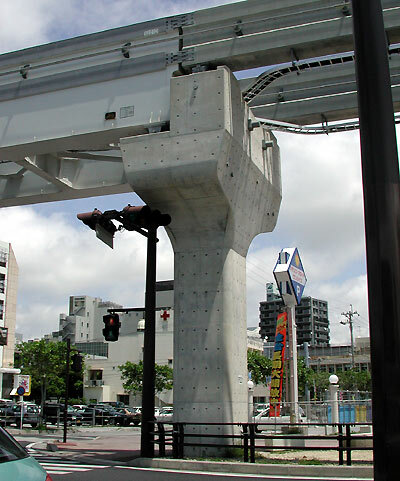 The system will opened in August of 2003, but thanks to the folks at Hitachi and Okinawa Monorail, we got this early sneak preview during testing. After a two hour flight from Tokyo-Haneda Airport, we arrived at Naha Airport. After a wonderful traditional Japanese meal, courtesy of Hitachi, we took a cab ride to follow the entire 12.9 kilometer monorail line. I still remember the look of astonishment on our taxi driver's face as his crazy American passengers would leap out of the cab to capture images and video as test trains would pass. 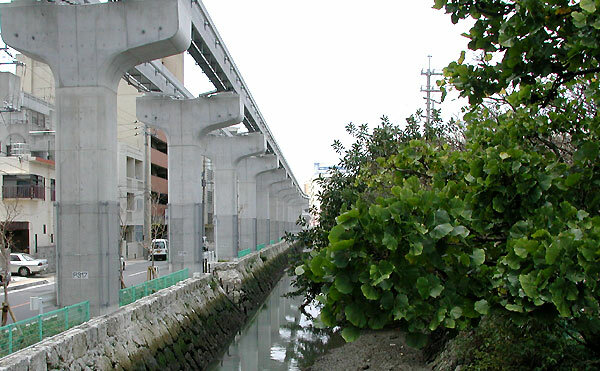 As you can see here, the monorail follows river canals in the downtown area of Naha. Monorails following rivers was first pioneered over 100 years ago in Wuppertal, Germany. It worked well then, it works well now. Where needed, longer spans of beamway are made of steel rather than pre-stressed concrete. This pylon is one of many that show the transition between the two types of track. Leaning out the taxi window, I managed to get this shot of a steel beam span crossing a road. 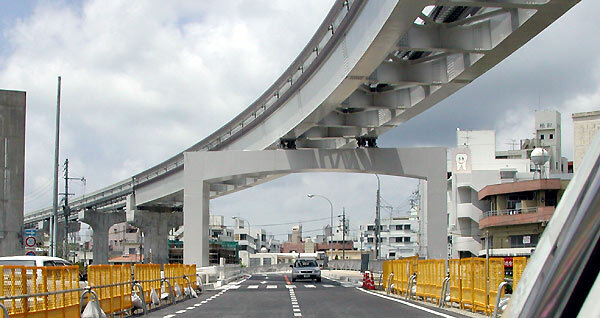 Dual steel tracks in Japan are more bridge-like with cross beams between the beams. The straddle bent that supports the track is also steel.